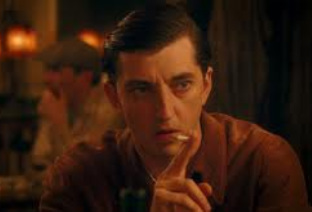 Adrie de Van as Luis Bunuel in Woody Allen's movie. Bunuel directing Catherine Deneuve in one of his last films, 'Belle de Jour'. Bunuel with Alfred Hitchcock in Hollywood during World War 2. Hitchcok was a great admirer of Bunuel's movies. The cinematic counterpart of Luis Bunuel doesn't get much screen-time in Midnight in Paris, but the director was one of the twentieth centuries most famous cinematic figures. When Gil meets Bunuel (and Salvador Dali) in the movie, he suggests the filmmaker make a movie about a party whose guests are unable to leave. Of course, in 1962 Bunuel made one of his most famous and controversial films , The Exterminating Angel, based on this premise. Although Bunuel's films are often inaccessible, frequently surrealistic, dark in tone and subject, and aim to shock and disturb bourgeois complacencies and religious belief, they have more in common with Woody Allen's movies than is first apparent. Some of Allen's movies contain surrealistic elements, such as the unexplained time traveling of Gil, and the removal and alteration of personality in Zelig or characters from a movie interacting with the a movie character in a movie audience in Purple Rose of Cairo. Bunuel launched full-frontal assaults on the Catholic Church, religious hypocrisy, ("I am an atheist, thank God"), middle-class morality and paternal authority in films such as Belle de Jour , Exterminating Angel and Viridiana. Allen's approach is milder, but one of his constant targets involves the delusion and fallibility of the well-educated bourgeoisie. Religion in various forms is also satirised; the Allen persona is often engaged in a comic search for religious meaning, while remaining dismissive of the various answers that various religions provide, especially to the vexed issue of life after death.. These themes -and Bunuel's sardonic interest in fetishism as a sort of bourgeois tic - appealed to Alfred Hitchock, who experimented with surrealistic elements in a couple of his late 1940s films. During the war years Bunuel was in exile in the USA and worked ifor the Museum of Modern Art and a film dubber for Warner Bros, where he met Hitchcock. Scene from 'The Exterminating Angel': the idle rich trapped at a dinner party they cannot leave. 'The Discreet Charm of the Bourgeoisie' is another of Bunuel's attacks on the foibles and vices of the middle-class. Several of Woody Allen's films use a dinner setting to expose tensions and flaws within a privileged section of the middle-class, e.g. 'Hannah and Her Sisters', 'Crimes and Misdemeanors'. Bunuel's Last Supper parody in 'Viridiana'. The Catholic Church was one of Bunuel's favourite targets. In Midnight in Paris, Kathy Bates gives a sympathetic portrayal of Gertrude Stein, one of the leading figures in Paris's cultural life for several decades. In the film, Stein appears as a genial, wise, dispenser of useful advice - literary,artistic and otherwise -to a circle of aspiring writers and artists, especially American expatriates, notably Hemingway. 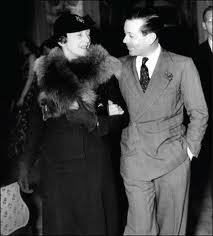 of whom she remarked 'he looks like a modern but he smells like a museum'. Her home at 27 Rue du Fleurus in the Montparasse is accurately depicted in the movie as a sanctuary where these people, often poor and hungry, met, drank and talked. The soirees shown in the movie are based on her legendary Saturday evening sessions where her guests mingled and argued in rooms filled with art by PIcasso, Cezanne and Renoir. She and her brother had accumulated a collection of post-impressionist art during 1903-13 before artists like Picasso became fashionable. (Brother and sister became permanently estranged after 1914, over issues such as Cubism and Gertrude's writing). Although Stein's role as a patron of the arts is undeniable, the genial image of her as presented by Allen and Bates is rather too generous. 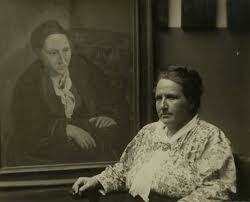 Gertrude Stein underneath her portrait by Picasso, photo by Man Ray. Some of Stein's friends complained to Picasso that the painting did not look like her. 'It will' was the the artist's reply. Alice B.Toklas, left and Gertrude Stein, right, in Stein's home, with Stein underneath Picasso's portrait. Kathy Bates as Stein, Note the Picasso painting on the wall. For several decades -not just the 1920s - Gertrude Stein was a leading figure in Parisian cultural life, and not just with expatriate American literary figures. Woody Allen and Kathy Bates give a benign portrayal of her in Midnight in Paris. She appears as a briskly benevolent, intelligent woman who provides encouragement and advice to young writers like Gil. Her house is a salon for aspiring artists and authors, American and European, where she dispenses alcohol, food, and cultural judgements. She did indeed run such a salon at her two-story house near the Jardin du Luxembourg. Her personality could be rather more severe and overbearing than appears in Bates' portrayal. In fact, a more realistic depiction of this brilliant, generous but deeply troubled woman would have spoiled the mellow mood of Midnight in Paris. One American observer of her salons described her as "an immense woman carcass,....enthroned on a sofa in the middle of the room where the pictures were hanging, with the forceful solemnity of a sibylla, she was examining pitiless all newcomers, assuming a high and distant pose". (cited by Humphrey Carpenter, Geniuses Together: American Writers in Paris in the 1920s [London: 1987, p.32] While she could be a thoughtful adviser and benefactor to struggling figures like Hemingway, she could also be overbearing, intolerant and convinced that her literary genius was insufficiently appreciated when it eventually became completely incomprehensible. Eventually Hemingway rejected her, probably after he became aware of her lesbian relationship with Alice B. Toklas - Hemingway, for all his man of the world manner, was squeamish about such matters. Porter's insouciant attitude was largely a pose, especially later in life. Porter with wife. The marriage lasted for 34 years, although it was widely suspected to be a disguise to shelter the songwriter's gay identity. The movie's Hemingway and Porter together in Paris. Porter had a reputation for holding Paris parties awash in alcohol and drugs. Porter had an easy and practised charm, ably conveyed in the vignette provided in Midnight in Paris. His mother came from a wealthy family, and Porter's early life as an only child was privileged and pampered. His doting mother encouraged his early musical abilities, and by age 10 he had written his first song. He went to the 'best' schools' and to Yale, where he spent a large part of his time writing for student musicals and sports teams. Then he started writing for Broadway musicals. He spent some time in France during the twenties, famous for his parties, which attracted many American expatriates like Hemingway as well as French cultural and show business figures. During the His first major success came in 1928 in his late thirties, when he wrote the music for the Broadway musical,Paris. Let's Do It, the song Porter sings in Midnight in Paris, comes from this show. 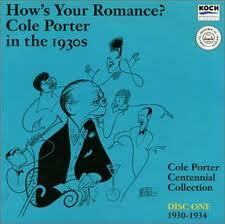 From then on he had a series of hit musicals throughout the 1930s, as well as writing Hollywood musicals. But a riding accident in 1937 crushed his legs (one eventually had to be amputated) and the forties were a fallow creative period. But in 1948 he wrote Kiss Me Kate, his biggest Broadway success,and followed it with another massive hit, 'Anything Goes'. His last success was the 1956 Hollywood musical, High Society. 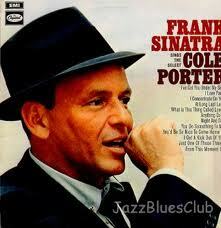 Porter died in 1964, recognised as one of America's leading musical figures of the twentieth century. His songs are still recorded today by major artists.